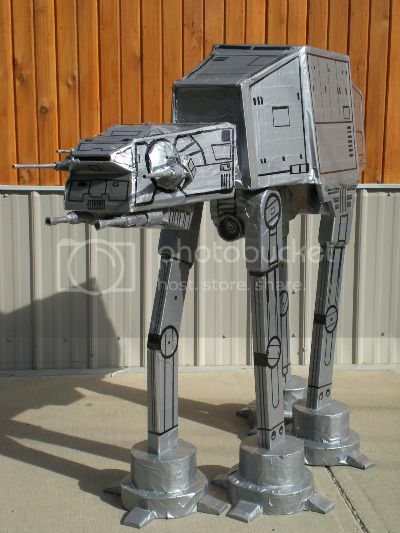 Some artist made a 4-foot-tall AT-AT out of wood, cardboard, duct-tape and Sharpie, and is selling it on Ebay for a starting bid of $400. Maybe somebody should tell him that the beautifully-detailed, fully-featured Deluxe AT-AT from Hasbro goes for a mere $100. Via boingboing, who’s willing to pay a $300 premium for duct-tape artistry. Yeah but his is 4′ and there’s is 2′ and his you can customize!! !